Launching a new commercial service in competition with an established operator is no easy task, to do so with new vehicles at high frequency in a city with previous negative experience of competition is the challenge that Cardiff based NAT Group has set itself with its X1 service. Commencing on Monday 11 May, the X1 will link Cardiff’s eastern and western suburbs across the city centre requiring up to ten vehicles daily. 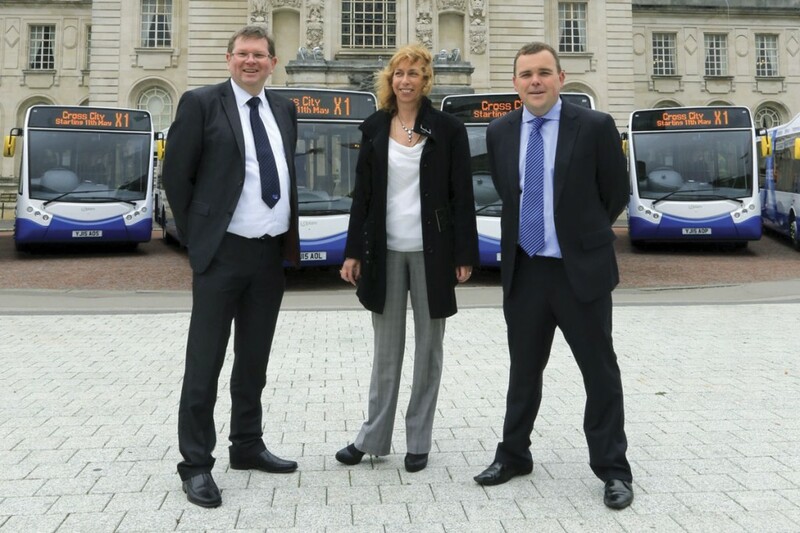 The company has chosen Optare’s MetroCity for the new operation, the whole batch of ten vehicles being unveiled to the public at a launch event in front of Cardiff’s iconic City Hall. Describing the new service, NAT Group Managing Director Kevyn Jones emphasised its cross-city nature, breaking through the ‘bus box’ of termini around the city centre to provide new journey opportunities. Demographic change in the city has also impacted on travel requirements with out of town and suburban shopping areas increasing in importance to local people as Cardiff city centre takes on a more regional role. The new service serves out of town superstores at either end and two of the most important suburban shopping areas, Canton and Albany Road. Kevyn said NAT Group had tried to be different to Cardiff Bus in the service’s routing through estates on the outskirts of the city as well as offering lower fares. They had made no secret of their intention to introduce commercial services in Cardiff, this one was the result of several years planning and is intended to be the first of a city network building on the continued rapid population growth expected in and around the Welsh capital. Looking forward, he would like to see multi-operator ticketing in the city although Cardiff Bus’ initial response has apparently been to offer discount ticket deals in a spring sale. The vehicles will be based at NAT Group’s Cardiff depot, just outside the city centre where 27 new drivers’ jobs have been created. Service X1 will operate every 15 minutes Monday to Saturday from 06.00 to 18.30, then dropping to every 20 minutes until 20.30. On Sundays, there is a 20 minute frequency between 08.00 and 18.25. 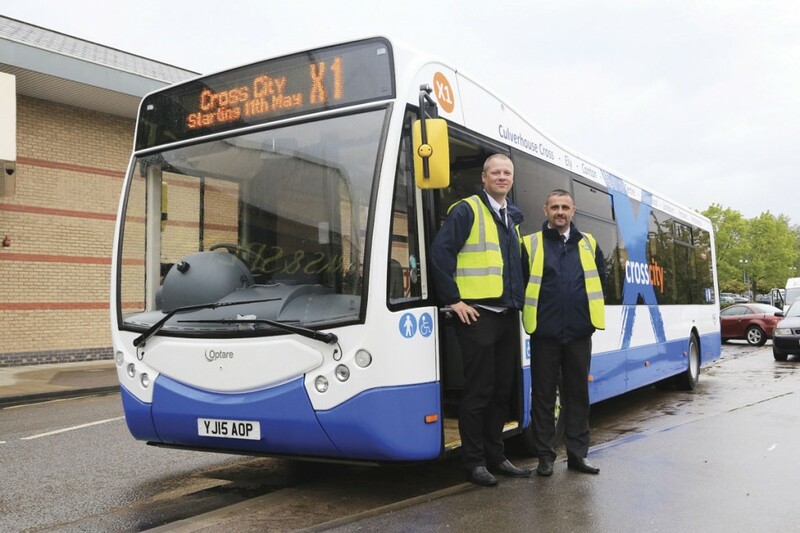 The ten Optare MetroCitys for the X1 were ordered at EuroBusExpo in 2014. They are to Euro5 specification with Cummins ISBe 6.7l six-cylinder engines developing 201bhp and Alison World Series 2100 transmissions. The 10.8m single door vehicles have an unladen weight of 7240kg and a 12 tonne GVW. 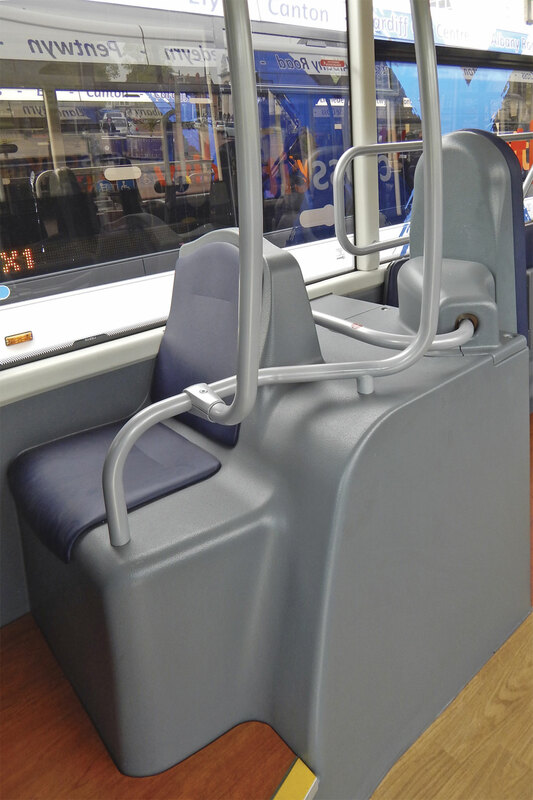 They are equipped with 40 E-leather trimmed seats including three tip-ups in the wheelchair bay giving a total capacity including standees of up to 62. A full camera system with video and sound recording has been specified together with wood effect flooring and a manual ramp. Externally, the vehicles carry NAT Group’s white and blue colour scheme to which bold blue and orange cross city branding has been added together with a list of the key points served. Following the formal handover outside Cardiff City Hall, the ten MetroCitys departed for a promotional tour along the new route, also providing an opportunity for further familiarisation for the drivers, including those from outlying depots who will support the route as required. As the rain arrived, I joined Damian Williams, Manager of the Pontypridd depot and Lukasz Dudek, one of his driving team for a full circuit. Joining the route just east of the City Centre, there is heavy traffic along Newport Road before the turn into suburban streets to reach the bustling Albany Road shopping centre, a popular destination for bus passengers. Turning north, after a steady climb through decreasing density housing, the route crosses the A48 and turns into the first of three major housing developments marking the dramatic expansion of Cardiff in the second half of the 20th Century, Llanyderyn. Like most of Pentwyn which follows, the route traverses relatively dense development, in contrast Pontprennau is all distributor roads with high greenery either side and roundabouts where most exits are no through roads into lower density housing. The terminus at Pontprennau has a rural feel with the nearby Asda well hidden. Retracing the route westwards, good use will be made of the bus lanes inbound to the city centre before heading out through another bustling suburban shopping centre in Canton, past Victoria Park with its Pie Shop and into the sprawling Ely estate. Beyond Ely, traffic on the approach to Culverhouse Cross slows the approach to the highly visible terminus situated between out of town Tesco and M&S stores. Bus lay-bys are provided here but with a limited service before the X1 arrives, most are filled with cars. The route presented no problem for the unladen MetroCity and its manoeuvrability in traffic was well demonstrated. Despite the rain, the wipers ensured there was always excellent visibility through the large front windscreen. 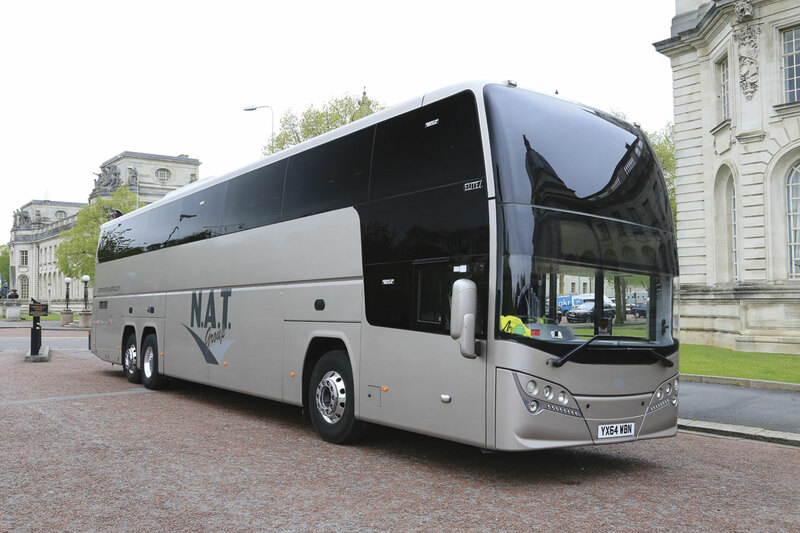 The drivers were generally happy with the vehicle and spoke positively of NAT Group’s regular investment in new vehicles which generated a high level of staff loyalty. From its formation as New Adventure Travel in 2008, NAT Group has experienced continuous growth, developing opportunities in both commercial and contracted bus services as well as a variety of coaching activities. Growth has included taking on many of the routes abandoned by Veolia around Pontypridd and the acquisition of other operators notably VR Travel of Merthyr Tydfil whose proprietor, Robert Price is now NAT Group’s Commercial Manager and, more recently, Select Local Bus. The latter brought a network of routes around Neath operated by a number of Dennis Darts; already an additional service and newer vehicles have been added to the operation. With the new vehicles for the X1, NAT Group will be operating nearly 90 vehicles from its four depots in Cardiff, Pontypridd, Swansea and Abercrave. The fleet has a diverse composition with continued investment in new and late model secondhand vehicles. On the bus side, Optare products now predominate with Solos, Versas and Tempos in addition to the MetroCitys. 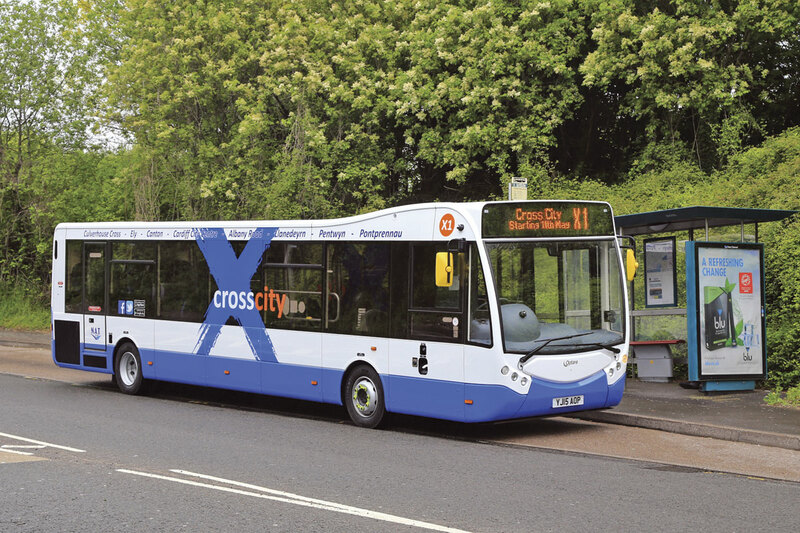 There are also ADL Enviro 200s, Scania OmniCitys (single and double deck), Volvos and many of the batch of Caetano bodied CitySmarts that MAN, in Kevyn’s words, ‘offered the right deal on’ in 2013/4. Looking to the next generation of full size single deck vehicles, Kevyn has recently placed an order for two Mercedes-Benz Euro6 Citaros which will be tested on operations from two of the depots. Anticipating positive results, he has an option on a further ten for delivery in 2016. On the coach side, NAT Group was the first company outside of Stagecoach to take the Plaxton Elitei and now has four, three with 75-seat maximum capacity that the company finds ideal for group and event travel and the latest addition, a high specification 48 seat corporate hospitality vehicle finished in gold which is also used by Swansea City football club. Further types recently added to the coach fleet include the Scania OmniExpress, Neoplan Tourliner and King Long midicoach. With the ten MetroCitys, NAT Group have taken delivery of 14 Optare vehicles during 2015, becoming a significant customer for Optare. The 2015 delivery includes four Solo SRs which have been distributed one to each depot for further assessment. 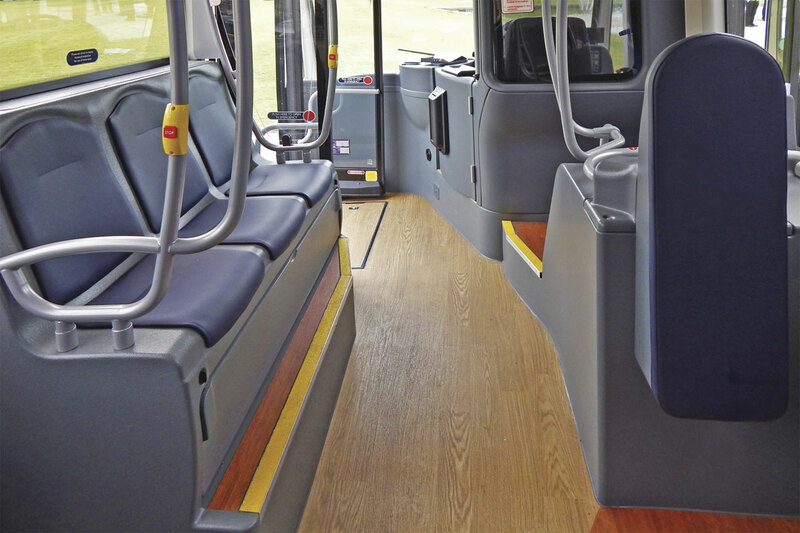 Kevyn has been impressed with the support he has received from Optare and the quality of the product delivered. 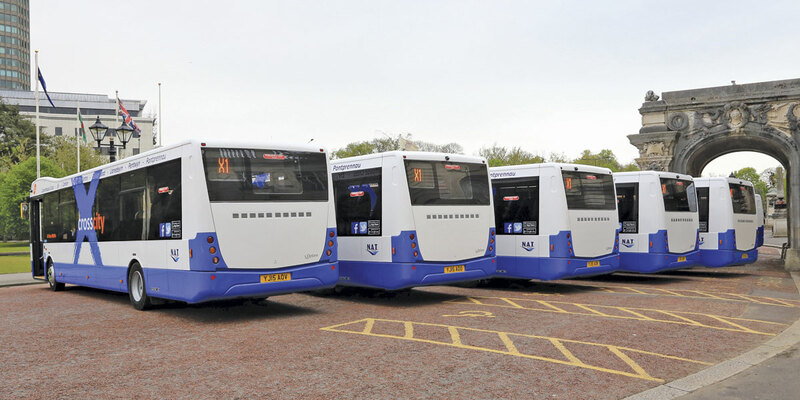 Inspection on delivery revealed only very minor issues with the MetroCitys and Optare are providing aftersales support at NAT Group’s Cardiff depot as the vehicles enter service. 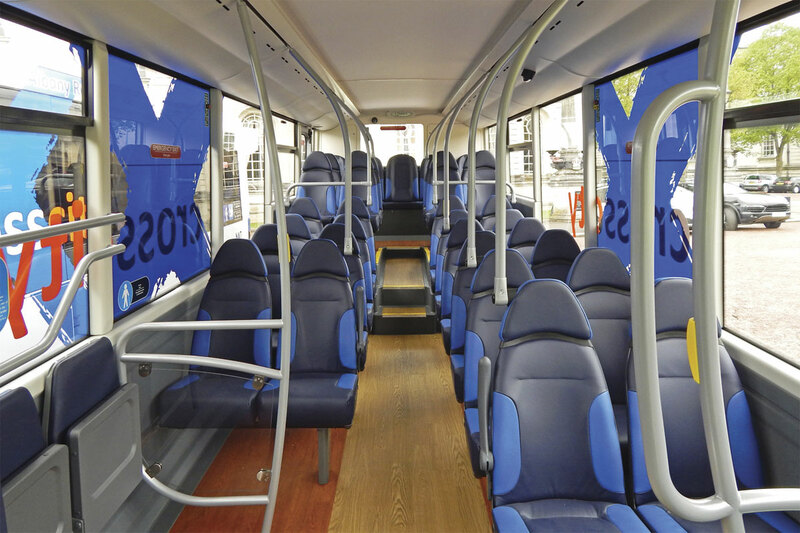 Kevyn has also expressed interest in a demonstration of Optare’s Metro Decker when this becomes available. Optare has repeated this success across Wales with a combination of Solo SRs and MetroCitys delivered to GHA Coaches of Wrexham (for services in Cheshire) and four 11.52m MetroCitys added to the 18 Optare vehicles already operated by Richard Brothers in Ceredigion.